I use Google Maps to find out where the bicycle lanes are, ran into an interesting issue, and submitted it to Google. 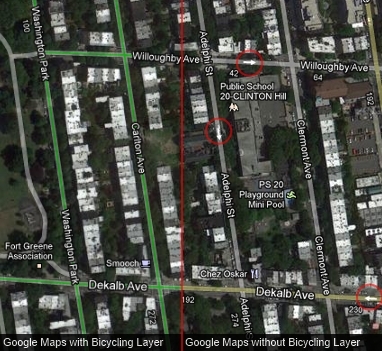 When I add the “Bicycling” layer to Google Maps, why are traffic directions removed? It’s really annoying*. This happens on Google Maps (PC/Mac, IE/Chrome and Android). Whether I’m on the go or planning a bicycle route, I would like to know which direction traffic is going. This past weekend, a few of us took ride out to Brooklyn from NYC via Brooklyn Bridge. We mapped out a plan to take Dekalb out east (to http://brooklynkolacheco.com/) After crossing the bridge, we came to a halt when we realized that Dekalb Ave is a one-way going west. We had to stop at Fort Greene Park and re-route to Willoughby Ave. In no more than 24 hours, I got a reply. Amazing customer service for a free product. Even though they don’t have an immediate solution for me, I’m impressed. We did want to let you know that we’ve escalated your report to the appropriate engineering team. Even though we don’t have an immediate fix to your problem, please be assured that we’re working hard for a resolution. Thanks for helping us to improve Google Maps! I’m hoping for a fix soon. Meanwhile, it’s only a few clicks to turn the layer on and off. You are currently reading Google Maps and the Bicycling Layer at thomas nguyen.